It is Monday, and I have the day off from work. I have time to make lunch today, rather than gulping down something at my desk as I work. 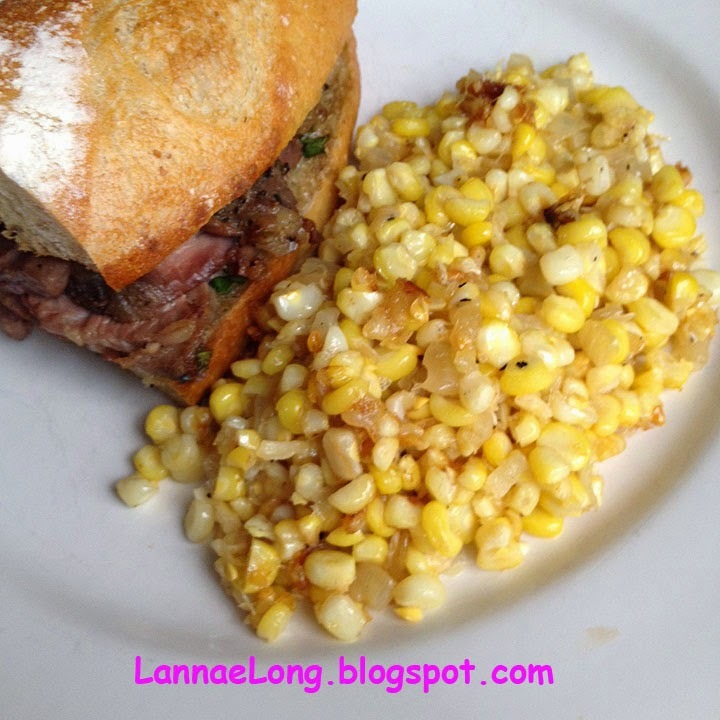 Today's lunch is the left over lamb sandwich I got from City House Sunday Supper, and homemade fried corn as a side. I have never made fried corn before. I feel like fried corn is a Southern type of side dish that goes well with almost anything! I got a bunch of ears of corn from my CSA Barefoot Farmer, and I wanted to try making Southern fried corn. I also got onions and garlic in my CSA, and I have cayenne from my organic veggie garden. As a good Southern Girl, I save bacon fat to cook with later on, and bacon fat seems to be the proper way to make Southern fried corn. Last night I blanched for a minute or 2 all the corn in boiling water. When they were cool, I cut the kernels and then put the kernels in the fridge. This morning, I got out my big fry-pan and heated 3 tablespoons of bacon fat over medium heat. I added the diced onion. When the onion became translucent, I added the corn kernels and garlic and turned up the heat to medium high. Then I sprinkled salt, pepper, and cayenne flakes (red pepper flakes) over the top, and drizzled 2 tablespoons honey over all the corn. I gave it a good stir to incorporate the honey. Then I let the pan sit to allow some of the kernels to brown. I gave the corn another good stir, and then let the pan sit to allow some of the kernels to brown. That is it! I put the corn on my plate with my sliced lamb sammie, and I had the perfect lunch. Fried corn took about 10 minutes to blanch and cut the corn the night before. It took about 10 minutes skillet fry the corn today. Fairly quick and easy, and delicious! For those of you who do not want to use bacon fat, a veggie or peanut oil would work, but not lend that smoky flavor bacon fat offers, so I would find some smoked salt, and even add some smoked paprika to add that smokiness back in to the dish. For those who don't want to use honey, regular sugar or maple syrup would work, and the substitution is 1 for 1, or 2 tablespoons of sweetness. It is possible not to use sweet stuff, if you get the super sweet corn from the grocery store. The corn I got from my CSA isn't the super sweet variety, so I have to add a little sweetness. I personally would not add artificial sweeteners, as most will not hold up to medium high heat on the stove (from the little I have read, many artificial sweeteners may breakdown to bad chemicals if heated). For those who cannot tolerate sugar, I would just leave sugar out of the dish and try to find super sweet corn instead.